How Do You Multiply Quotients of Monomials by Canceling Factors? 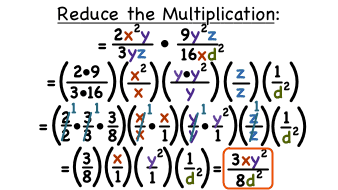 Multiplying fractions made up of monomials is easier than you might think! You can cancel common factors in the numerator and denominator to make things easier to work with. Then just multiply to get your final answer! This tutorial will show you how.